Yep - another spectraflair franken today made with the coarse grade stuff. 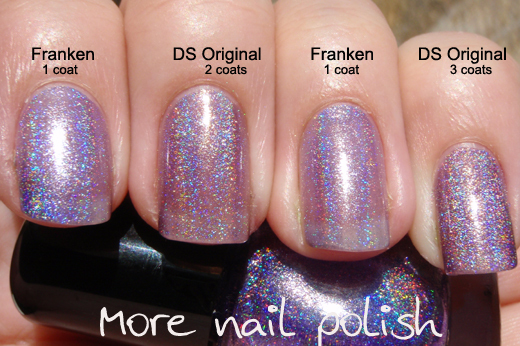 When I created this and applied it, I said to myself "wow, that looks just like OPI DS Original". You know then one right? 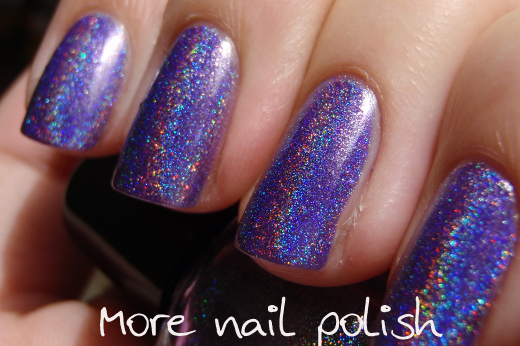 That hard to find spectacular holo polish. So I quickly swatched them next to each other. They look pretty similar in colour don't they? Especially with these first indoor pictures. I have called this franken 'Not so original'. 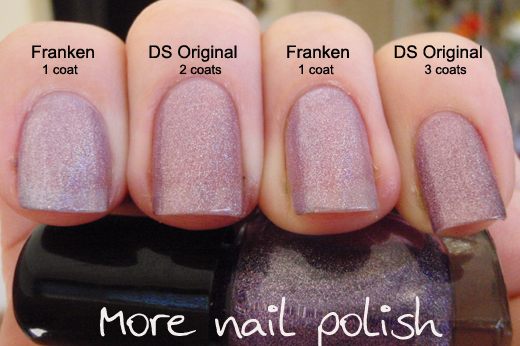 I have one coat of the franken on the index and ring fingers, two coats of DS Original on the middle finger, and three coats of DS original on the pinky. And here it is in the sun. The holo effect on both of them is really similar. Next I applied a second coat to my franken fingers. 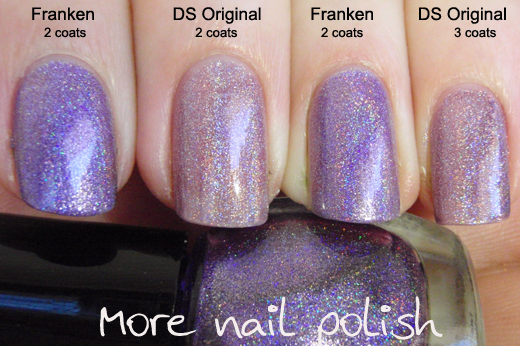 This photo is back indoors and shows that with two coats my franken is darker. And do you know what? 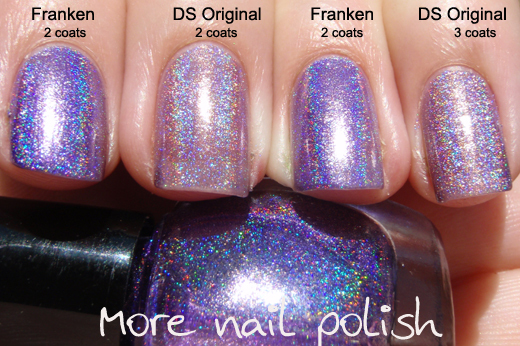 I think I actually prefer my franken to OPI DS Original. I know, that's blasphemous right! 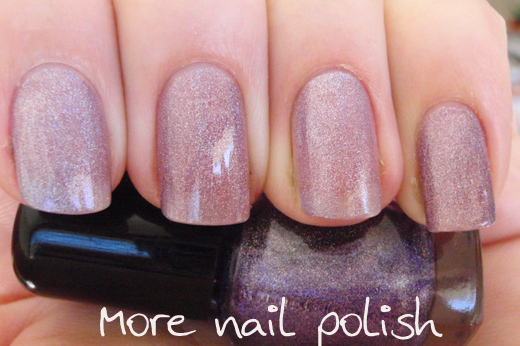 Because I loved this one so much, I applied it as a full mani. So this is base coat, three coats of the franken and SV top coat. 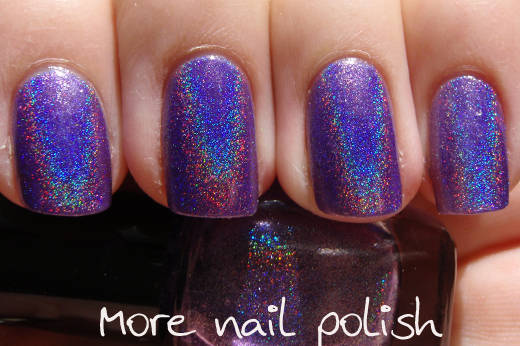 You've gotta love that these Spectraflair franken holos don't dull with top coat. And they don't need any fancy aqua base either. 3 incy wincy straw spoonfuls of Spectraflair coarse grade. Just like alexandrarc said in the comments of the last post "Who knew KC was good for spectrafrankens!" I know, right!. Kleancolor is just smashing it out of the park for me. I love it cause they are cheap too, and everyone can buy them. In fact I just placed another Beauty Joint order for more Kleancolors. If you don't have all the metallics, you have to get them!! Wow! Your franken is amazing! I like it much more than the opi. I agree with everyone else: yours is a better colour! love this. 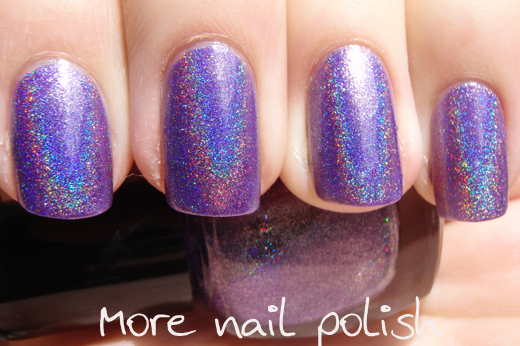 you capture holos really well, too! This looks amazing! 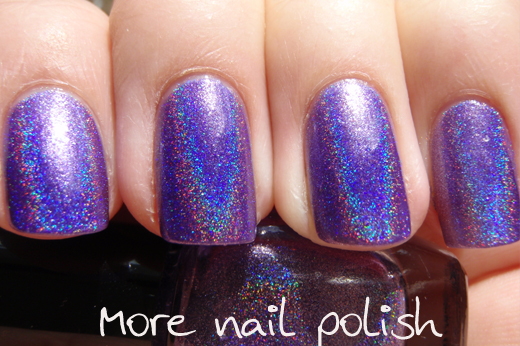 I may just have to go but some KC polishes now. To be quite honest, I prefer your franken over Ds Original. Yours has so much more character!! Oh that's so gorgeous, I want it! So many lovely photos! I really like your Franken compared to the DS! IKR? 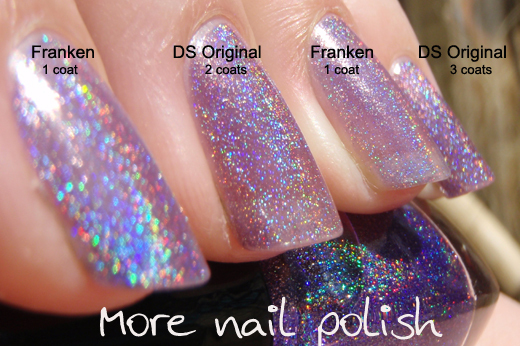 Lol I knew you were going to like that term "spectrafranken"
Better than the OPI one! Waaaaaaaaaaait, wait wait wait. SV doesn't dull coarse spectraflair????!?!??? Keely - I know, Yay. 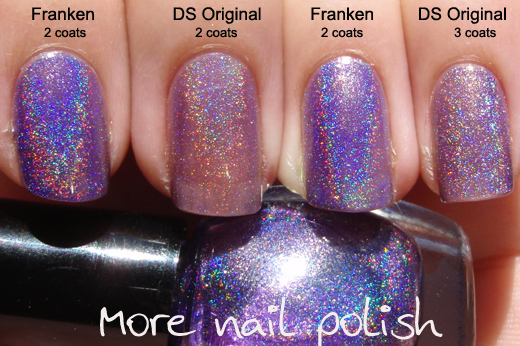 All my frankens have been wearing SV top coat. Yes your franken is way better. Wow, this looks amazing! I need to try this! Where can I get spectraflair?